Firecracker Flower plants are very decorative, compact flowering shrubs that grow 18"-24" tall. They have glossy, dark green leaves and spikes of brightly colored, funnel shaped flowers that continue to bloom for months on end. Firecracker Flowers are easy plants to grow and care for, as long as they have sufficient water and humidity. They are excellent plants for growing in planters which can be brought indoors in the winter months and grown as a house plant. Unfortunately, Firecracker Flowers are only hardy in USDA zones 10-12.
and planted in well-drained soil that has been amended by adding an equal part of peat moss. Indoors, keep your Firecracker Flower in an uncrowded, draft free area where it will receive bright, indirect light, with a little morning sun if possible. They grow extremely well under fluorescent grow lights. Firecracker Flowers thrive in warm, daytime temperatures of 75° with cooler, 60°-65° nights. They require relatively high humidity, so it is a good idea to set the planter on top of a tray filled with moistened stones. Misting the foliage is helpful, but do not mist the flowers! During the active growing season from March to October, the soil should be kept evenly moist but never soggy. Feed every 2 weeks with a soluble, house plant fertilizer that has been diluted by 50%. Reduce watering and stop feeding during the dormant winter months. Repotting should be done in February, using a rich, fast draining, peat moss based potting mix. Cut back stems that have flowered by one half in late winter to promote branching. Keep a vigilant watch out for for spider mites and white flies. Firecracker Flower plants are easily propagated with 3"-4" stem cuttings taken early in the spring. 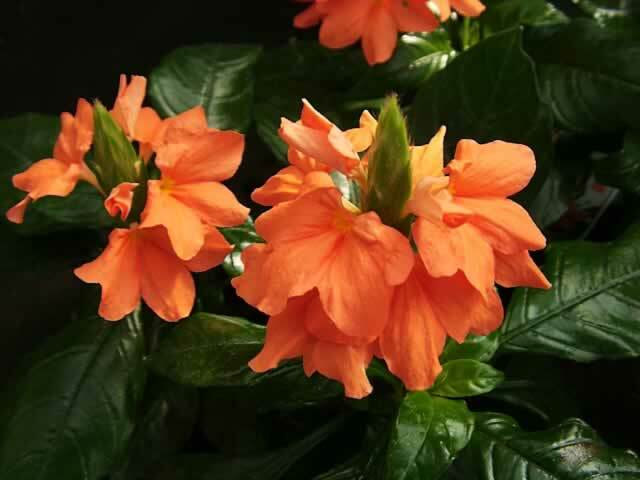 Crossandra seeds require light for germination, so don't cover them! Sow seeds indoors during any season. Maintain a temperature in the growing medium of 75°-80° until germination, which takes 25-30 days.